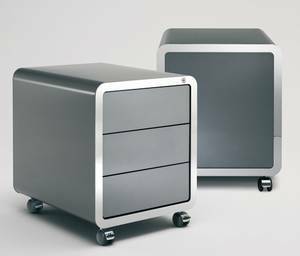 Description Office drawer set cut from 1mm thick sheet metal, hand-welded and lacquered in a wide choice of colours with glossy finish on the outside, drawers and edges (semi-matt finish available on request). You have the choice of 3 regular drawers or 1 drawer and 1 filling drawer (all with central latching) both on castors. Optional chrome edges.